Sri Lanka’s premium entertainment channel TV Derana has become the first and only Sri Lankan YouTube channel to pass one million subscribers, cementing its position as the most trusted and well-received entertainment portal with the largest audience in the country. TV Derana’s YouTube Channel was created just seven years ago in January 2012 and during this period the channel’s subscriber base increased steadily. 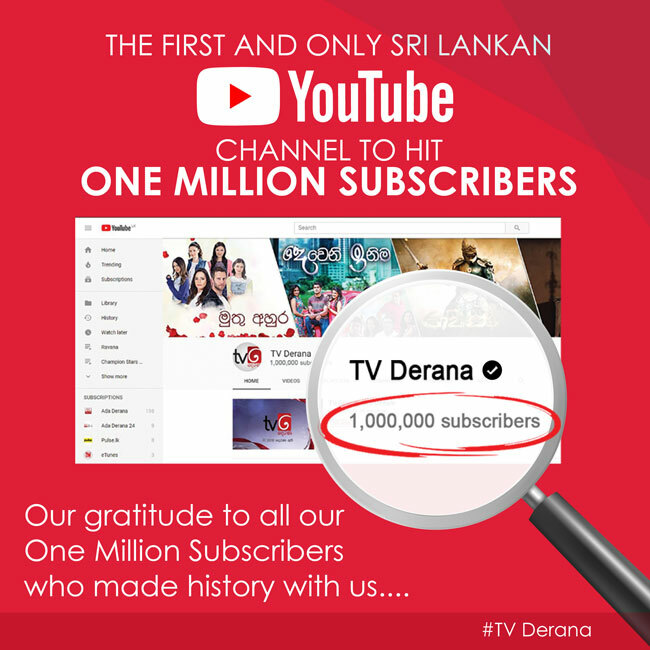 TV Derana’s YouTube channel now boasts the highest subscriber base among all the YouTube channels in Sri Lanka. The over 13,000 videos uploaded so far on TV Derana’s YouTube channel have generated more than 847 million views in total with a watch time of 12,792 years over its lifetime. The channel receives over 400,000 video views on an average everyday with a watch time of 25 years. The content uploaded on Derana’s YouTube channel varies from teledramas, reality shows, musical and educational programmes among a host of others. Teledramas aired on TV Derana such as “Mali,” “Sidu,” “Deveni Inima” and the latest hit series “Ravana” are among the most watched programmes on television as well as online in the country. ‘Deveni Inima” teledrama has an average of 600,000 to 650,000 views for every episode which is a unique record for a daily soap in Sri Lanka. The achievement is a landmark honour in the growth trajectory of Derana, which has been consecutively rated No. 1 by conventional media research companies. Derana is a premium entertainment and news channel offering multichannel access including television, radio, and online services. A pioneer in digital content and online entertainment in the country, Derana aims to transform and revolutionise Sri Lanka’s television industry while taking it to new heights. Derana has stayed true to its brand credo of “Protecting indigenous values while protecting our future” and has won the hearts of Sri Lankans across the spectrum with the multilingual offerings on its platforms. Derana is synonymous with cutting edge innovative and fresh entertainment content, and has been recognised for delivering the most ethical and unbiased news and current affairs content. With a corporate objective of “Purpose Beyond Profit”, Derana operates not only terrestrial television, radio and digital portals but also uses its influence to spearhead large scale social transformation initiatives that meet national needs. Among them, are programs such as ‘Manusath Derana’ which has championed the cause of chronic kidney disease prevention, care and support; the ‘Derana Daruwo’ scholarship program for children of CKD affected families; the ‘Lassana Derana & Manusath Derana’ keeping Sri Lanka clean initiative and the ‘One Million Trees’ project, a drive to plant one million trees. Coinciding with TV Derana reaching a million YouTube subscribers and celebrating the milestone of becoming the first Sri Lankan YouTube channel to achieve this landmark, the ‘One Million Trees’ project initiated by Manusath Derana Nature Force will also be brought to its completion. The ‘One Million Trees’ project, a nation-wide tree planting campaign, was launched by Manusath Derana Nature Force on October 28, 2018 to mark the 13th anniversary of TV Derana under theme “Magen Gasak Mavu Deranata” (A Tree for Mother Earth from Me). Several phases of this national tree planting campaign were launched island-wide during the last few months along with the participation and cooperation of a number of public and private institutions in the country as well as hundreds of volunteers, environmentalists and the people of Sri Lanka. Tree planting campaigns have been carried out in various parts of country in areas ranging from coastal regions to schools and in cities and villages. In addition to this Derana viewers were also invited to participate in the campaign by planting a tree in their gardens. Sri Lankan leaders including President Maithripala Sirisena, the Maha Sangha and religious leaders have joined hands with Manusath Derana and pledged their support for the initiative. The final phase of the campaign, signaling the completion of a million trees planted all around Sri Lanka, ceremonially commenced on Monday (11th February). Manusath Derana Team received the final 12,000 plants required to complete the ‘One Million Trees’ campaign from the plant nursery of the State Timber Corporation in Nikaweratiya. Out of those plants, 10 were symbolically planted at the premises of the Ridi Viharaya in Ridigama, Kurunegala at 3.30 p.m. on Monday (11th February), with the participation of the the Custodian of the Ridi Viharaya, marking the launch of the final phase of the ‘One Million Trees’ campaign.